Employing artisan traditional cold process soap making methods, Country Rose Soap Co. has been making our natural soaps from scratch, by hand, using the finest quality vegetable oils and fats, therapeutic grade essential oils, and natural mineral colourants for the past 17 years. Trying handmade soap is a real treat, but have you ever stopped to consider exactly, "what is soap"? Soap is water, sodium hydroxide (commonly known as lye), and fats (or oils). When a lye and water solution is mixed with fats, the chemical reaction called "saponification" takes place -- the reaction of hydrogen, oxygen, sodium, and fatty acid molecules. The end result is made up of about 3 parts soap and 1 part glycerin. Properly made handmade soap has no lye left in it, but it cannot be made without it. Our ancestors made up a weak lye solution from wood ash to produce their handmade soap. Glycerin is a rich emollient prized for its ability to moisturize the skin. This prized commodity is retained in our handmade soap, but it is extracted in commercial soap as a valuable by-product, leaving the hard, drying soap bars of soap sold commercially. Handmade soap, on the other hand, is rich and moisturizing. It will soothe and soften the skin. Country Rose Soap Company has dedicated years to perfecting our various formulas, utilizing added natural emollients such as jojoba oil, shea butter, cocoa butter, goatsmilk, pure emu oil, as well as olive, coconut, palm, castor, and sunflower oils -- oils which are sometimes first infused with organic herbs and flower botanicals. Olive oil makes the gentlest, mildest handmade soap, and we use this wonderful oil in abundance. In fact, it is the sole oil used to produce our 100% olive oil castile soap bars. Coconut oil produces a rich, creamy lather and enhances hardness. Palm oil makes for a mild soap with a long lasting lather while also enhancing the final hardness. Not all handmade soaps are created equal. The percentage of oils used is extremely important to produce a mild and gentle soap. 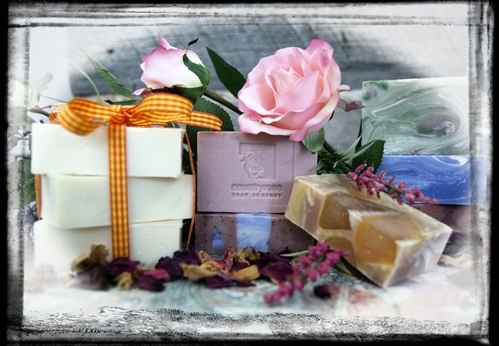 Country Rose Soap Company is committed to using the finest quality natural ingredients. Scented with pure essential oils, coloured with natural mineral colourants and cosmetic grade clays, many of our soap varieties also incorporate flower botanicals and herbally infused oils. Our handmade natural soap batches are made with pride. After saponification the soap is removed from its wooden mold, cut into loaves, and finally into individual soap bars, ready to cure for a minimum of 4 weeks. This curing time is imperative as it makes for a mild and gentle, hard bar of soap. Because handmade soap retains its naturally occurring glycerin, each bar can be used right down to a fine sliver without cracking or drying like commercial soaps have a tendency to do. Our entire handmade soap making process takes over one month, but the end result is a handmade soap that lathers richly, moisturizing as it cleanses, leaving your skin feeling clean, soft, and supple. If you have never tried handmade soap, you are in for a treat. Country Rose Soap Company sincerely hopes you enjoy using our soap as much as we enjoy making them.